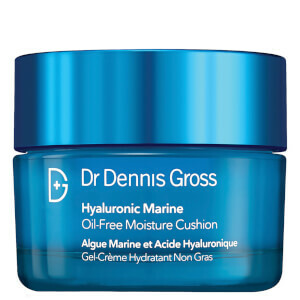 Replenish parched skin with time-released hydration from skincare superfood Hyaluronic Acid with the Moisture Rescue Kit from Dr Dennis Gross’ Hyaluronic Marine™ range. Presented in a sleek blue box, the rescue kit combines three of the range’s top-sellers, all designed to drive moisture deep into the skin and lock-in moisture for a supple, dewy radiance. A single-use skin-transforming mask that delivers intense hydration to your complexion for a revitalized, supple result. The refreshing mask begins as a gel and powder; when mixed together, they form a unique experiential texture with long-lasting hydration for ultimate skin-plumping effects. When applied to skin, the mixture morphs from a gel substance to a solid through a cooling chemical reaction and the process of express hydration facilitates an oxygen exchange, sweeping away dirt and impurities from the pores. Enriched with professional-grade Algin and Hyaluronic Acid, the formula boosts the skin’s water-holding capacity and supplies it with essential minerals and microelements for a dewy finish that glows with radiance. A multi-dimensional eye corrector formulated to target puffiness and dry fine lines. Enriched with moisture-attracting Hyaluronic Acid and elasticity-improving Japanese Green Caviar Algae, the lightweight, oil-free gel saturates the delicate skin surrounding the eyes with moisture that plumps and blurs the appearance of fine lines, wrinkles and crow’s feet, whilst improving the skin’s texture. Caffeine, Caribbean Gargonian Extract and Sarsaparilla Root work in synergy to address the appearance of dark circles and puffiness by reducing water retention under the surface. A unique water-break gel-cream formulated to deeply penetrate the skin with moisture. The lightweight, oil-free formula helps skin look smoother, softer and healthier without clogging pores. Enriched with Japanese Marine Algae harvested from the waters of the southernmost island of Okinawa, and fortified with essential amino acids and B vitamins, the gel’s plumping effect improves the skin’s elasticity. 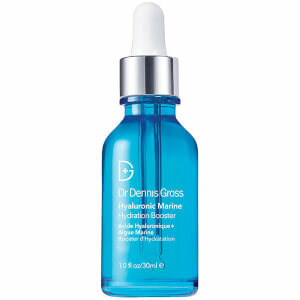 Key ingredient Hyaluronic Acid chronospheres (known for its ability to hold up to ten times its own weight) delivers time-released hydration to dull, dehydrated or dry skin for a dewy and supple finish that lasts throughout the day. 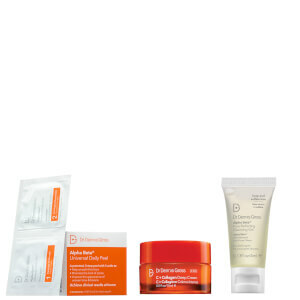 On clean, dry skin apply Hydrating Modelling Mask following packet instructions. Follow with Dew It All Eye Gel by gently taping a small amount around the eye area. Finish with Moisture Cushion, smoothing all over face. Modelling Mask: Step 1: Water/Aqua/Eau, Glycerin, Algin, Lithium Magnesium, Sodium Silicate, Sodium Hyaluronate, Oryza Sativa (Rice) Powder, Xanthan Gum, Citric Acid, Disodium EDTA, Conchiolin Powder, Dehydroacetic Acid, Benzyl Alcohol, Fragrance (Parfum), Blue 1 Lake (CI 42090). Step 2: Glucose, Calcium Sulfate, Tetrasodium Pyrophosphate, Magnesium Oxide. Eye Gel: Water/Aqua/Eau, Butylene Glycol, Glycerin, Caprylic/Capric Triglyceride, Silica, Sodium Hyaluronate, Saccharide Isomerate, Caulerpa Lentillifera Extract, Sea Whip Extract, Smilax Aristolochiifolia Root Extract, Glycyrrhiza Glabra (Licorice) Root Extract, Caffeine, Panthenol, Glucosyl Hesperidin, Asiaticoside, Madecassoside, Disodium Rutinyl Disulfate, Stearyl Heptanoate, Sodium PCA, Lactic Acid, Trehalose, Hydrogenated Lecithin, Citric Acid, Sodium Hydroxide, Acrylates/C10-30 Alkyl Acrylate Crosspolymer, Glyceryl Polyacrylate, Sodium Citrate, Xanthan Gum, Dimethicone, Sodium Potassium Aluminum Silicate, Carbomer, Phenoxyethanol, Benzyl Alcohol, Tin Oxide (CI 77861), Mica (CI 77019), Titanium Dioxide (CI 77891). Moisture Cushion: Water/Aqua/Eau, Cyclopentasiloxane, Cetearyl Alcohol, Dimethicone, Butylene Glycol, Stearyl Dimethicone, Caprylic/Capric Triglyceride, Octadecene, Glyceryl Behenate, Sodium Acrylate/Sodium Acryloyldimethyl Taurate Copolymer, Sodium Hyaluronate, Caulerpa Lentillifera Extract, Aloe Barbadensis Leaf Extract, Tocopherol, Phospholipids, Citrullus Lanatus (Watermelon) Fruit Extract, Cocos Nucifera (Coconut) Fruit Extract, Citrus Sinensis (Orange) Fruit Extract, Cinnamomum Cassia Bark Extract, Saccharide Isomerate, Vaccinium Myrtillus Fruit/Leaf Extract, Glycolic Acid, Lactic Acid, Saccharum Officinarum (Sugar Cane) Extract, Citrus Aurantium Dulcis (Orange) Fruit Extract, Citrus Limon (Lemon) Fruit Extract, Acer Saccharum (Sugar Maple) Extract, Collagen Amino Acids, Hydrolyzed Soy Protein, Leuconostoc/Radish Root Ferment Filtrate, Lactobacillus Ferment, Acrylates/Carbamate Copolymer, Isohexadecane, Polysorbate 80, Dimethicone Crosspolymer-3, Ethylhexylglycerin, Isododecane, Disodium EDTA-Copper, Ceteareth-20, Potassium Cetyl Phosphate, Sorbitan Oleate, Linalool, Limonene, Fragrance (Parfum), Hydroxyisohexyl 3-Cyclohexene Carboxaldehyde, Citronellal, Hydroxycitronellal, Citral, Citric Acid, Sorbic.